Viral capsids assembled in the nucleus can migrate to the cytoplasm by utilizing an unusual export pathway termed nuclear egress . 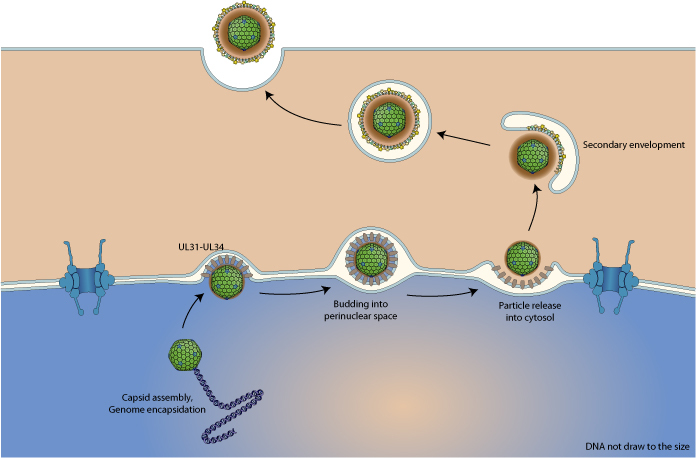 In this process, the viral capsid is delivered into the perinuclear space, producing a vesicular intermediate after fission. After fusion with the outer nuclear membrane, the naked capsid is released into the cytosol. A recent study now suggests that this pathway might be an endogenous cellular pathway, co-opted by viruses, that serves to transport cellular cargo exceeding the size limit imposed by the nuclear pore complex .